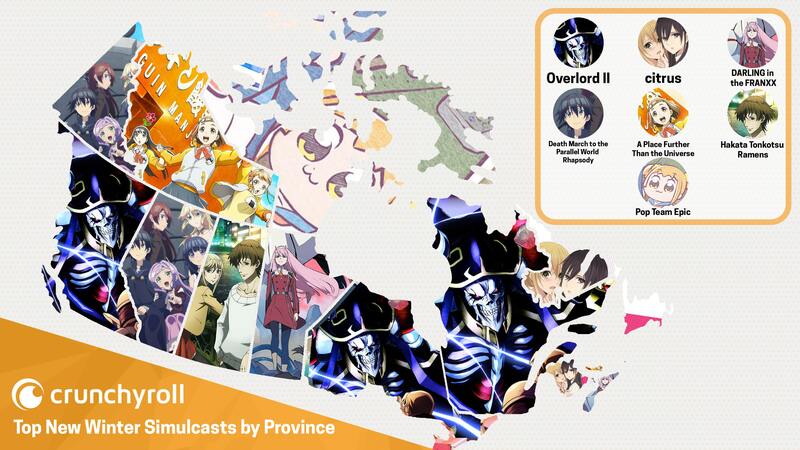 Anime streaming service Crunchyroll has unveiled the most popular simulcasts for the Winter 2018 season in Canada. The map does have a major caveat in that it’s restricted to shows/sequels that debuted during the season. Multi-seasonal series like Boruto and Dragon Ball Super are not included. Shout out to the two people in Nunavut watching Pop Team Epic. It’s surprising to see Cardcaptor Sakura: Clear Card get completely shut out up here. Say what you will about Nelvana’s English dub of the original series, but it was on a mainstream Canadian television channel for years in both English and French. You’d think there would be a sizeable fanbase lingering or at least people curious to relive a childhood favourite. It seems that only works if you’re Toei as Clear Card barely registered on Crunchyroll’s U.S. chart (Idaho and Wyoming aren’t exactly the most populated states) and wasn’t any European country’s most popular. Even Australia and France, two countries that received interesting takes on the original, seemingly couldn’t care less about the sequel. GKIDS has confirmed with me that the upcoming Cineplex run of Mary and the Witch’s Flower will solely be available in its English and French dubbed release. A representative stated that the subtitled Japanese theatrical screenings were limited to the theatres that carried the January 18-19th premiere event. In Canada, only Vancouver’s Vancity Theatre participated. I wondered how Spin Master would react to a number of Asian toylines cashing in on Bakugan’s novelty. Well, their strategy seems to be to take them to court. Earlier this week, Spin Master filed a lawsuit against Alpha Group for patent infringement in Canada, the United Kingdom and the United States. The Canadian toyco claims Alpha’s Screechers Wild! toyline violates patents they own relating to Bakugan’s transformation mechanics. Spin Master is looking to stop the sale of the toys and receive damages for what’s already been sold. Alpha Group responded to the lawsuit, stating that they intend to fight Spin Master’s allegations and have no intention of withdrawing the property from the market. Screechers Wild! is a western repackaging of Alpha’s earlier Chinese toyline Opti-Morphs. Similar to Bakugan, both feature toys that trigger a magnet-activated transformation gimmick when rolled onto a metal object. Screechers Wild’s new fiction, which was co-developed by Man of Action and Wexworks Media, consists of web-shorts released on YouTube and an in-development television series. The web shorts were animated by Vancouver’s Atomic Cartoons with a cast of Vancouver voice actors courtesy of Vida Spark Productions. Pictured: Eonster Hunter. In the immortal words of Ryan Davis, China don’t care. Spin Master has also launched a patent infringement case against GuangZhou Lingdong Creative Culture Technology Co. Ltd for its Eonster Hunter property. Like Alpha, the company hails from China, though unlike Alpha, they don’t have much of an international footprint. Intriguingly, Spin Master has yet to comment on Turning Mecard, leading some to suggest the Toronto-based giant is picking on small fry. Like Screechers, the line is about spring-loaded magnet activated transforming toys. Unlike Screechers, Mecard is backed by American heavyweight Mattel with its fiction created by Bakugan’s Atsushi Maekawa. Turning Mecard launched in Australia and Canada last May. The toys will debut in the United States this spring. GuangZhou Lingdong distributes Mecard product in China. Spin Master is currently developing a Bakugan reboot alongside Nelvana and TMS Entertainment. It is due out sometime between 2018 and 2019. Beyblade Burst Evolution went is set to go into re-runs on Teletoon after last Sunday’s broadcast of episode 19 after episode 21 airs on Sunday, the 18th. No idea when premieres will resume. Update (2/23/2017): Greg informed me that I had some dates and episodes wrong. My apologies for the mistake. Elsewhere, French Canada’s Télétoon la Nuit will be launching Rick and Morty sometime this spring. I don’t really cover [adult swim] programming, but I’m making an exception because this is a weird case. While the series received a French dub upon its debut in France back in 2015, Télétoon has commissioned its own to be produced in Quebec. Sylvain Hétu will play Rick while Philippe Martin has been cast as Morty. Lastly, we end off on Before We Vanish, a Japanese live-action film directed by Kiyoshi Kurosawa (Sweet Home, Pulse). Mongrel Media is releasing the film in Canada and a week-long theatrical run started in Toronto on Friday.